The Real Estate Board of Greater Vancouver (REBGV) reports that residential property sales in Metro Vancouver reached 4,056 on the Multiple Listing Service® (MLS®) in May 2015. This represents a 23.4 percent increase compared to the 3,286 sales recorded in May 2014, and a decrease of 2.9 percent compared to the 4,179 sales in April 2015. Last month’s sales were 16.7 percent above the 10-year sales average for the month. “We continue to see strong competition for homes that are priced right for today’s market,” Darcy McLeod, REBGV president said. “It’s important to remember that real estate is hyper local, particularly in a seller’s market. This means that conditions and prices vary depending on property type, neighbourhood, and other factors." New listings for detached, attached and apartment properties in Metro Vancouver totalled 5,641 in May. This represents a 5 percent decrease compared to the 5,936 new listings reported in May 2014. The total number of properties currently listed for sale on the region’s MLS® is 12,336, a 23.2 percent decline compared to May 2014 and a 0.8 percent decline compared to April 2015. The MLS® Home Price Index composite benchmark price for all residential properties in Metro Vancouver is currently $684,400. This represents a 9.4 percent increase compared to May 2014. 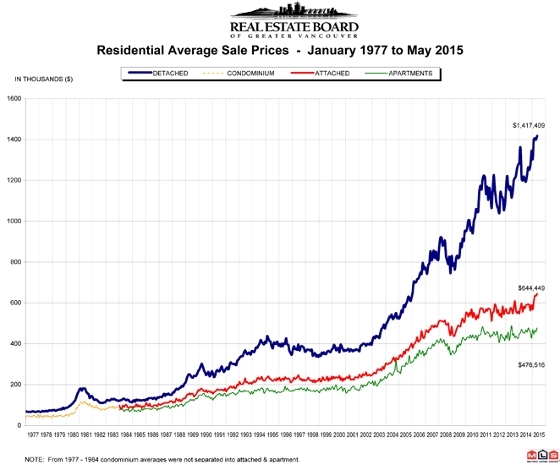 The sales-to-active-listings ratio in May was 32.9 percent. This is the highest that this ratio has been in Metro Vancouver since June 2007. Sales of detached properties in May 2015 reached 1,723, an increase of 18.6 percent from the 1,453 detached sales recorded in May 2014, and a 42.2 percent increase from the 1,212 units sold in May 2013. The benchmark price for a detached property in Metro Vancouver increased 14.1 percent from May 2014 to $1,104,900. Sales of apartment properties reached 1,600 in May 2015, an increase of 24.4 percent compared to the 1,286 sales in May 2014, and an increase of 40.8 percent compared to the 1,136 sales in May 2013. The benchmark price of an apartment property increased 4.6 percent from May 2014 to $396,900. Attached property sales in May 2015 totalled 733, an increase of 34 percent compared to the 547 sales in May 2014, and a 37.3 percent increase from the 534 attached properties sold in May 2013. The benchmark price of an attached unit increased 6.4 percent between May 2014 and 2015 to $501,000.